Triggers or as we call them Campaigns are the auto-populated message, that would be displayed to the selected group of audience on your website.These triggers/Campaigns can be targeted for a bigger group of audience or can also be used to target a specific group of people. These campaigns are used and run to redirect the potential visitors through a funnel to specific requirements they came looking for. For example, if someone has searched for “Co-browsing” on google and visited our page, we can redirect such audience to our Co-browsing page directly or engage them in one on one communication through these campaigns. On this screen, we can see Trigger name, Status of trigger,Analytics, Owner and Actions tab.Trigger Name is self explanatory here, Status refers to campaign being enabled or disabled and owner depicts the one who designed the campaign or owns it. 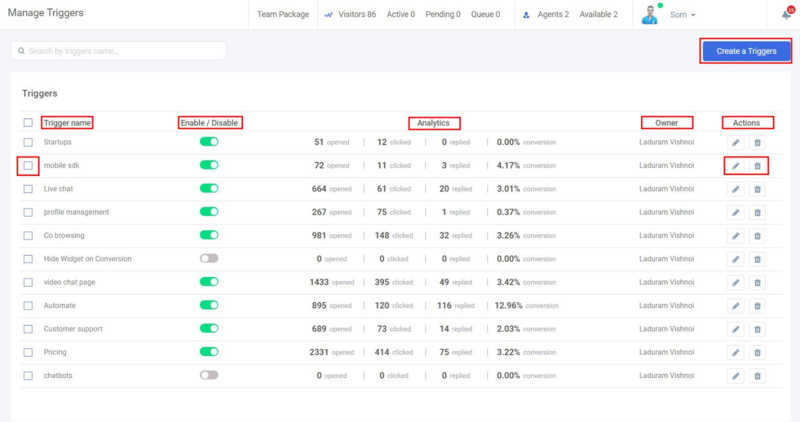 Moving next to Analytics and Actions, under the Analytics we have Open rate that shows us how many such a campaign was opened by the user, Click Rate that shows us how many times the campaign was clicked and activated. Next up we have Replies, that we will show how many users have replied to that campaign. This is an actual check of how well the campaign has been going on.Next is the Conversion rate, that will show the percent of conversion, that will be how many people have replied from the people who have opened the campaign. Here you have two options under the actions tab, that are Edit and delete. And, if you click on that “Trash” icon just next to it, you will be able to delete the trigger. Once you click on that icon, a pop up would appear on screen, asking for confirmation to delete it once Again. Once clicked on okay, the Campaign/Trigger will be deleted.